Consider: At least 10 states have been investigating whether some of the country’s largest insurers are failing to pay out unclaimed life policies to beneficiaries. California and Florida have held public hearings on the issue in recent weeks. Insurers say they are behaving lawfully. Under policy contracts, they aren’t required to take steps to determine if a policyholder is still alive, but instead pay a claim when beneficiaries come forward. You can avoid such problems by securing important documents and telling your family where they are stored. Jean Parr is grateful that her mother obsessed about the subject. “I really didn’t want to think about it,” says Ms. Parr, 54 years old, a manager at the American Chemical Society in Washington. But when her mom died in 2005, she knew exactly where to look for the will, the key to a safe-deposit box and documents indicating her mother had paid and arranged for her own funeral. 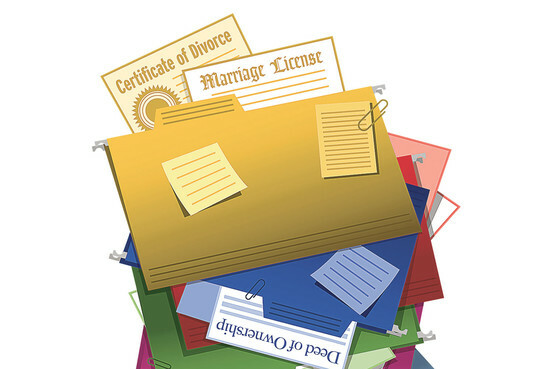 You can store the documents with your attorney, lock them away in a safe-deposit box or keep them at home in a fireproof safe that someone else knows the combination to. That isn’t to say you should keep everything. Sometimes people hold onto so many papers that loved ones can’t find the important ones easily. In 2008, Jane Bissler, a counselor in Kent, Ohio, approached her then-87-year-old mother about organizing her documents. Because her mom was a widow with relatively simple finances and two homes, Ms. Bissler, 57, says she figured it would be a relatively simple task. Instead, it took an entire year for Ms. Bissler and her mother to go through all of her papers, which included documents from eight bank accounts, utility bills from the 1950s and reams of canceled checks. The two of them pared down the stash from four four-drawer filing cabinets to one two-drawer cabinet, shredding anything extraneous. Ms. Bissler and her mother visited banks and brokerages to ensure she was listed on all of her mother’s accounts. Her mother died in May 2009. “It would have been a total nightmare if we hadn’t gone through it all with her,” Ms. Bissler says. “It was that Depression-era stuff where you keep everything and hide other things.” Ms. Bissler estimates that having the documents organized ahead of time spared them from ordering an additional 15 copies of the death certificate and “years” of time. Here is a rundown of the most important documents you’ll need to have signed, sealed and delivered. You should start collecting these as soon as possible and update them every few years to reflect changes in assets and preferences. Some—such as copies of tax returns or recent child-support payments—need to be updated more often than others. An original will is the most important document to keep on file. A will allows you to dictate who inherits your assets and, if your children are underage, their guardians. Dying without a will means losing control of how your assets are distributed. Instead, state law will determine what happens. Wills are subject to probate—legal proceedings that take inventory, make appraisals of property, settle outstanding debt and distribute remaining assets. Not having an original document means this already-onerous process could be much more of an ordeal, since family members can challenge a copy of a will in court. If your family can’t find the original trust documents, you are “basically setting your estate up for litigation,” says Duncan Moseley, vice president of Sanders Financial Management in Atlanta. A “letter of instruction” can be a useful supplement to a will, though it doesn’t hold legal weight. It is a good way to make sure your executor has the names and contact information of your attorneys, accountants and financial advisers. While the will should be stored with your attorney or in a courthouse, the letter of instruction should be more readily accessible, particularly if it contains instructions on funeral arrangements. Also, make sure your heirs have access to a durable financial power-of-attorney form. Without it, no one can make financial decisions on your behalf in the event that you are incapacitated. You should keep documentation of housing and land ownership, cemetery plots, vehicles, stock certificates and savings bonds; any partnership or corporate operating agreements; and a list of brokerage and escrow mortgage accounts. If you don’t tell your family that you own such assets, there is a chance they never will find out. Mr. Moseley says in such an event, clients must perform their own detective work, watching the mail for real-estate tax bills or combing bank accounts for interest payments, for example. File any documents that list loans you have made to others, since they could be included as assets in an estate. Similarly, keep a list of any debts you owe to avoid surprising your family. Wills and living trusts generally are drafted to include provisions for how debts should be settled, and creditors have a stipulated period of time in which to file a claim against the estate. Make the most recent three years of tax returns available, too. “Looking at last year’s returns offers a snapshot of what assets we should be looking for this year,” says Lesley Moss Mamdouhi, a principal at estate-law firm Oram & Moss in Chevy Chase, Md. This also will help your personal representative file a final income-tax and estate return and, if necessary, a revocable-trust return. Mr. Law recommends sharing a list of all accounts and online log-in information with your family so they can notify the bank of your death. “If nobody ever takes any more out or puts money in, it becomes a dormant account and then becomes the property of the state,” he says. Be sure to list any safe-deposit boxes you own, register your spouse or child’s name with the bank and ask them to sign the registration document so they can have access without securing a court order. Possibly the most important health-care document to fill out in advance is a durable health-care power-of-attorney form. This allows your designee to make health-care decisions on your behalf if you are incapacitated. The document should be compliant with federal health-information privacy laws, so that doctors, hospitals and insurance companies can speak with your designee. You may also need to fill out an Authorization to Release Protected Healthcare Information form. If you are incapacitated and your family can’t locate a health-care power of attorney, they will have to go to court to get a guardian appointed. Porter Storey, executive vice president of the American Academy of Hospice and Palliative Medicine in Glenview, Ill., says it isn’t enough to establish a health-care power of attorney unless you have explained to your designee how you would like to be treated in case of incapacity. He also recommends writing a living will detailing your wishes. After Diane Dimond’s mother had a series of strokes in 2006, Ms. Dimond knew there was a signed living will tucked away in a safe at home. Ms. Dimond, 58 and living in New York, recalls the Sunday she watched her mother in a coma and was able to fulfill her wishes never to be kept on external life support. “It was gut-wrenching,” she says, “but I took the physician aside and said, ‘I want to take her home. '” Having her mother’s living will enabled Ms. Dimond to do just that. The living will and the power of attorney constitute what are called “advance directives”; some states consolidate these into a single form. (AARP offers a state-by-state listing of advance-directive forms on its website.) Terminally ill patients may wish to have their doctors sign a do-not-resuscitate order. Certain companies, such as Advance Choice Inc.’s DocuBank, will keep copies of health-care documents for a fee. Subscribers get a wallet-sized card and, in case of an emergency, a hospital will call DocuBank, which will fax over the information. 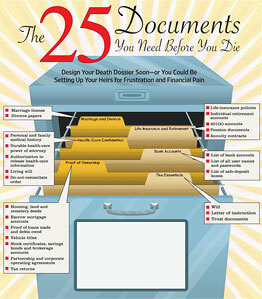 Copies of life-insurance policies are among the most important documents for your family to have. Family members need to know the name of the carrier, the policy number and the agent associated with the policy. Be especially careful with life-insurance policies granted by an employer upon your retirement, since those are the kind that financial planners most often miss, says David Peterson, CEO of Denver-based Peak Capital Investment Services. New York state alone is holding more than $400 million in life-insurance-related payments that have gone unclaimed since 2000, according to the state comptroller’s office. Estate planners also recommend that you draw up a list of pensions, annuities, individual retirement accounts and 401(k)s for your spouse and children. An IRA is considered dormant or unclaimed if no withdrawal has been made by age 70½. According to the National Association of Unclaimed Property Administrators, tens of millions of dollars languish in unclaimed IRAs every year. If your heirs don’t know about these accounts, they won’t be able to lay claim to them, and the money could languish. The U.S. Department of Labor estimates that each year tens of thousands of workers fail to claim or roll over $850 million in 401(k) assets. You can track unclaimed pensions, 401(k)s and IRAs at Unclaimed.com. Ensure your spouse knows where you have stored your marriage license. Mary Cay Corr, now 74 and living in Raleigh-Durham, N.C., couldn’t locate hers when her husband died. “I had to write to New York, where we got married, and pay for a new marriage license to prove that I had been married to my husband before I could claim anything,” she says. For divorced people, it is important to leave behind the divorce judgment and decree or, if the case was settled without going to court, the stipulation agreement, says Linda Lea Viken, president of the American Academy of Matrimonial Lawyers in Chicago. These documents lay out child support, alimony and property settlements, and also may list the division of investment and retirement accounts. Include the distribution sheet listing bank-account numbers that accompanied the settlement to avoid disputes about ownership or payments due. Also include a copy of the most recent child-support payment order. In the majority of states, the obligation to pay child support still exists after death. Ms. Viken also recommends filing copies of any life-insurance papers. In many states if you have a policy that benefits your children, it can be set off against the ongoing child support. You also should include a copy of the “qualified domestic-relations order,” which can prove your spouse received a share of your retirement accounts.